PanARMENIAN.Net - Twin sisters Sahkanush and Haykanush Stepanyan learned rugmaking while still teenagers at a craft center in Gyumri, Armenia’s second-largest city. Today at 23, they work for Tufenkian, a company that specializes in carpets made of hand-carded, -spun, -dyed, and -knotted wool. Under a hot July sun on the National Mall in Washington, D.C., they are stretching warp threads vertically over the timbers of a large loom, entwining the horizontal weft thread between them, over and under in a basket-like pattern, Smithsonian Mag says in a new article. Perhaps the most renowned of the Armenian arts is carpet making, a domestic craft that women took up at home in the late hours of the day as a quiet reprieve from cooking, cleaning and childcare. 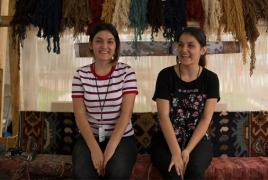 For the Stepanyan sisters, who are participants at the Smithsonian Folklife Festival this summer, once each row is completed, individual strands of thread will be knotted around pairs of warp threads, varying the colors to make intricate patterns. “These rugs were mainly used for personal reasons, such as dowry pieces, gifts, commemorative pieces,” explains Hratch Kozibeyokian, who is a master weaver and scholar on the history of the craft, and serves as president of the Armenian Rugs Society, located in Glendale, California. Eventually the work was commercialized, he says, during the 19th century and merchants began paying women by the square inch. The Armenian communities, he says, are now rediscovering their histories through the stories that these rugs tell. Kozibeyokian says he relies on a knowledge that has been handed down through the years one generation to another, and cultivated through experience and ongoing study. “I come from a family that has been in this trade, in this craft for at least the four generations that I know of.” And untold generations before that, he says. “[A rug] is still produced the same way as it was a thousand years ago.” Although occasionally the weaver will be a man, today just as in ages past, it is usually women who take responsibility for maintaining and extending the art, training the weavers who will carry it forward. Despite a long and rich history of carpet making, Armenians have had to battle to maintain a hold over their own tradition. The work of the Armenian weavers was so prized that it was praised by observers from Herodotus (“brilliant colors”) to Marco Polo (“the choicest and most beautiful”). During the Middle Ages, Armenians rugs were traded and dispersed throughout the Middle East and Europe so that by the time of the Renaissance, Armenian rugs appeared under the feet of saints in altarpieces by painters as renowned as Hans Memling, Hans Holbein and Lorenzo Lotto. But unfortunately, as these woven masterpieces were swept up into a global trade and appreciation, their provenance was lost and many Armenian rugs and their styles have been either appropriated by, or attributed to, other cultures. The Folklife Festival will conclude after a final run from July 4 through July 8, 2018.